As a child growing up in Soweto, South Africa under the reign of apartheid, Majova-Seane was inspired by the impact her father, headmaster of a school, had on the lives of young students. Majova-Seane began her career in education in 1987 as a middle school math and science teacher. 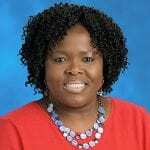 After earning a master’s degree in Mathematics Education and a certification in Educational Leadership, she moved through the leadership ranks of several middle and high schools in the Duval County Public School system. During her career, Principal Majova-Seane gained a reputation as a thoughtful and charismatic leader. When Majova-Seane became principal of Stanton College Preparatory School in 2010, one of her first responsibilities was to become familiar with the school, its stakeholders, and the community. Stanton had a highly rigorous academic tradition, College Board Advanced Placement (AP) programs, and a dedicated magnet for International Baccalaureate (IB). Majova-Seane’s challenge was to maintain the tradition of high expectations while increasing access for students in the neighborhood and district-wide. Having served as principal of two challenge schools prior to joining Stanton, she was already passionate about inclusion. She was eager to extend Stanton’s reach beyond dedicated magnet middle schools. When the Duval County Public Schools started an Opportunity Scholars program which assigned students from challenge schools to Stanton, there was a shift in Stanton’s student population. Majova-Seane worked hard with the school community to shift the mindset from tracking students, based on the middle school they attended, to meeting children where they are and their needs – a guiding principle of Ubuntu. To create a community of lifelong learners at Stanton, Majova-Seane implemented a professional development team of teachers designed to empower and inspire peers. Through research and needs-based assessment, these teachers facilitate professional development that allows them to share best practices. She often tells teachers “the answer is in the room” when they are facing challenges, sending the message that the combined experience and expertise of staff is highly valued. One of the most significant programs Principal Majova-Seane developed was the Summer Bridge program for incoming freshman. She recognized that the diversity of student experiences prior to Stanton was vast and transitioning to a highly rigorous campus might be challenging for some students. To help incoming students acclimate to the academic culture and, more importantly, to emphasize the culture of Ubuntu, she developed a week-long program. During the program, student leaders serve as role models and new students attend classes. Students participate in team-building exercises and learn about the many clubs and programs offered at Stanton. Recently, parents were invited to attend the last day of the Summer Bridge program to further emphasize the idea of Ubuntu. In addition to implementing after school academic tutoring and access to technology for homework completion, she also provides one-to-one meetings with struggling students, affectionately called a “Majova Fix.” With Ubuntu as a guiding principle, Principal Majova-Seane made Stanton a place where all students feel like they belong.